This unique white invite features a sleeve like design used to partially conceal the writing on your invitation. The sleeve consists of a delicate laser cut floral pattern which boasts added texture from brilliantly embossed details within the pattern. The invitation is finished with raised ink printing which adds a classic touch. 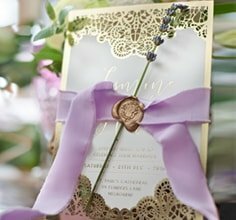 Brides looking for an invitation which treads between a traditional invitation and a modern design will love how this invite features the best of both worlds.